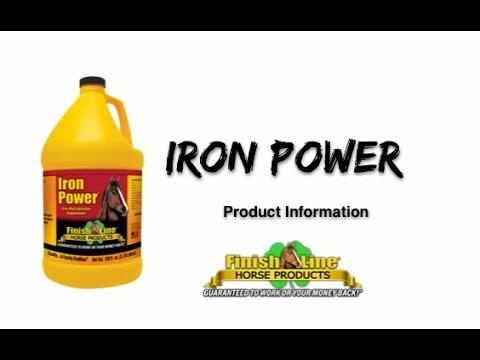 A high iron, high B-Complex liquid vitamin supplement highly recommended by trainers, Iron Power™ is an easy-to-feed liquid that contains biotin, with a unique apple flavor so your horse will actually eat it! Supplementation for low blood counts does not usually work, but Iron Power™ is absorbable and keeps blood counts high. This is needed for any performance horse to compete at optimum levels. Higher blood counts give greater resistance to diseases and assaults from poisonous plants, and help reduce Founder, or Laminitis, a disease that causes separation of the laminae, or white line, in the hoof, a very painful and usually life-ending process for the horse. Water, Ethyl Alcohol, Ferrous Sulfate, Citric Acid, Xanthan Gum, Niacinamide, D-Calcium Pantothenate, Sorbitol, Vitamin B12 Supplement, Thiamine Mononitrate (source of Vitamin B1), Riboflavin (Vitamin B2), Cobalt Sulfate, Sucrose, Honey, Sodium Benzoate, Pyridoxine Hydrochloride (Vitamin B6), Artificial Apple Flavoring, Saccharin, Natural Marsala Flavoring, Copper Sulfate, Folic Acid, Biotin. Foals: Feed 1 oz. daily. Orphan Foals, Colts, Yearlings: Feed 2 oz. daily. Mature Horses in Training: 4 oz. daily for 15 days, then 2 oz. daily. For equine use only. Do not exceed recommended feeding instructions. If conditions persist, consult a veterinarian. Keep out of reach of children. Store at room temperature. Protect from freezing. Keep container sealed when stored. Honestly I don't know why I haven't bought this product before. I will say it's going to be used daily. The amount of vitamins and the flavor is just wonderful, yes I myself tried it I always taste everything I give my horses. I highly recommend this product, the only suggestion is a spoon for measurement. Other wise its tops !! Thankyou fromBekland Farm , breeders of colorful Morgan horses. I had a mare that was in danger of foundering. I bought remission from this site and Iron Power was on the recommendation list of products to go with it. I went ahead and ordered a gallon, and I believe with the remission the combination is what brought my mare back to her old self. She has grown a new hoof completely, and the dangers of foundering are gone. I would definitely recommend this product in addition to any supplements to help with founder. My mare loved the apple flavor, and would sniff the bottle wanting more. Smells like apple cider. i bought this after i found out that senior horses stop producing iron on their own after age 25. after a month of giving it i noticed a complete turn around in my appendix QH he had more energy and his overall look was better (coat, hooves, etc.) he only gets a joint supplement with it so i know that this is the miracle worker. i ride him 4x a week and he turned 31 in April 2011.